Fit-Ink: It's a Girl for Deena Kastor! First it was Kara. Then it was Paula. Now it's Deena. Except this time around it's not so much playmate as it is playdate. Colt and Raphael are going to have to fight over Andrew and Deena Kastor's new addition to the family, a daughter: Piper Bloom Kastor, born February 21, weighing in at 6 pounds, 5 ounces, and measuring 20 inches. 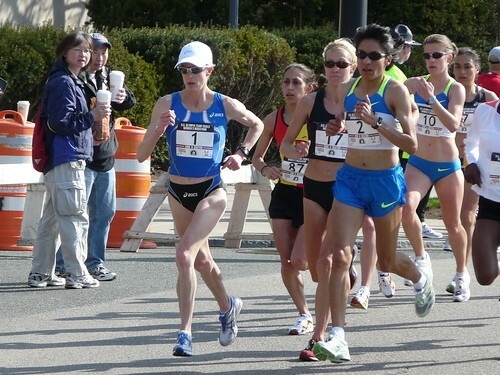 Can we expect wedding bells 20 or 30 years down the road, linking two great marathon moms? Piper is the first child for the Kastors, and she was the reason Deena dropped out of the 2010 New York City Marathon last November. You can't run a race at blistering fast speeds when you've got a baby in tow--probably not too healthy either, unless you slow down the pace. Like Goucher and Radcliffe, the baby timing couldn't have been better for Kastor who still has plenty of time to run a 2011 marathon and perhaps set her eyes on qualifying for the 2012 London Olympics. The Chicago Marathon is still more than seven months away and Kastor has torn up that flat and fast course before. Could she...? Will she...do it again in October? It's probably too early to tell. But in the meantime, maybe these moms can put competition aside and meet up to push the kiddos in the jogger strollers? It might be easier for Goucher and Radcliffe to do since they've charted similar race schedules in the past--like the New York Mini 10K--but Kastor won't have to wait long for a jogger stroller buddy without needing to leave Mammoth Lakes. Josh Cox's wife Carrie is pregnant with their first child, and if Josh has daddy duty, I wouldn't be surprised if it will include a long run or speed work with baby in tow. But we'll save that for next month when the 2011 baby watch (or whatever term People coined it among the celebrity set) continues. Photo grabbed from Brian Sawyer at flickr.